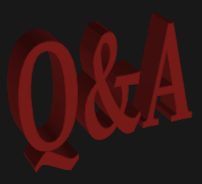 You are browsing the Blog for Q&A. Please consider joining us for the ADHD & the Justice System Preconference on July 24th, 2014 in Orlando, FL! Over the past several months, we’ve been working hard to organize a preconference session on ADHD and the Justice System. We have put together an engaging program and an impressive line-up of speakers. This event is going to be a great opportunity to learn more about the relationship between mental health and justice issues, as well as to network with some remarkable professionals. And yes, we will also be offering CE credits. We really hope you will consider attending this event, and of course encourage you to share the information with anyone else you think may be interested. We look forward to seeing you in Orlando! We hope you will take a minute to read the flyer below and check out the program outline. You can find even more information by clicking HERE. 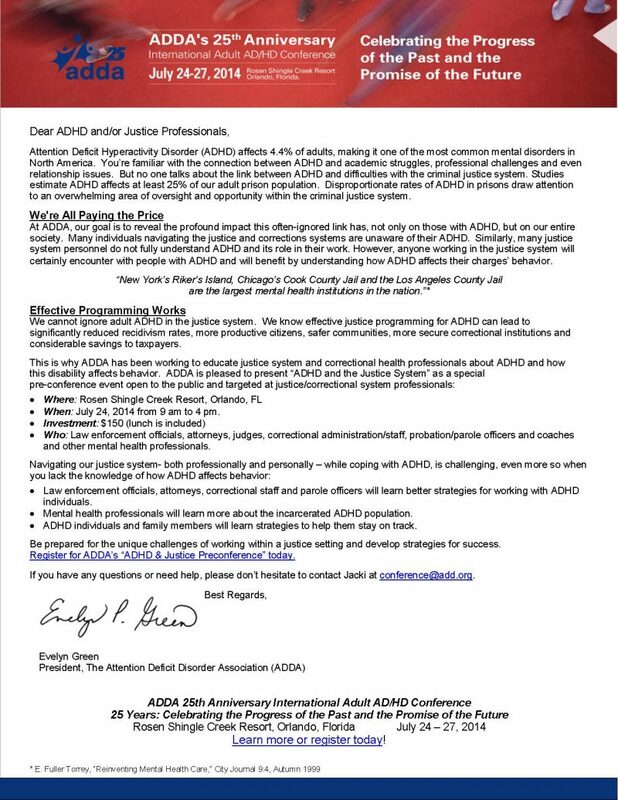 Comments Off on ADHD Justice Preconference! I am contacting you in regards to my 19 year old daughter was caught shoplifting. It was her first time ever in any kind of trouble. We did not know what we were doing. I could not afford a lawyer and neither could she. She was charged $1000 bail, which my oldest son borrowed from five of his friends and my daughter is still paying back. She faced the judge without a lawyer. She did not make a connection with that judge, he was harsh on her. He sentenced her to 12 Shoplifting Classes ($400 came out of the bail + an additional $240 to my daughter). Additionally, she was sentenced to eight hours of road crew and 60 hours of community service. Neither she nor I understood that some of the bond could have been used to pay for a lawyer. Stupidly, I did not think a first time offense would be so severe and expensive. The judge applied all of the bail to various costs and fines. She completed the classes and her road crew. However, she did not complete the community service in time. [My daughter] is not good with time management, meeting deadlines, being on time; she has ADD and it very negatively impacts her life. She put it off toward the end and still thought she had a week left when they told her it was going back before the judge. We are afraid to face this judge without a lawyer. [My daughter] does not have the ability to advocate for her or the confidence to say anything to the judge that may be of help. She understands that she was wrong to shoplift and in her failure to complete the community service on time. I do not want her to go to jail because she failed to manage her time properly or because she shoplifted one time in her life. We are living paycheck to paycheck now; more fines will be a burden for us. I also struggle with the ADD so I have dropped the ball on helping her make deadlines. Morgan’s ADD is really causing her problems now that she is out of school. She misses doctor appointments even with reminders. Prior to the shoplifting she had a couple speeding tickets. I thought she had until the end of August to complete the driver’s class online. She got in an accident on August 22 and almost on the same day; her license was suspended for not completing the class on time. We didn’t respond in time to the ticket, which increased the fines. The shoplifting occurred prior to the accident so I was afraid for her to plead guilty without a lawyer. The judge said she didn’t qualify for one. Then on the rescheduled court date, she forgot about it and overslept at a friend’s house. It was a nightmare. Then she was charged with contempt. She is a good kid. She does not do drugs. In high school, when she a junior her big brother was diagnosed with Leukemia and the same time I was laid off. His first transplant failed; it was a very difficult journey for us all. Morgan helped out a lot with her little brother during that time. She helped keep us afloat with money from her part-time job, which she still does. She tried community college in the fall this year, but was immediately overwhelmed. Of course, she didn’t quit in time or follow through with the financial aid properly so we are on the hook for the first semester’s tuition. Any assistance you can offer is so appreciated. [My daughter] is not a kid who belongs in the criminal justice system. I am so worried for her. We need help. It would help to find your daughter a local advocate to at least write a letter to the judge, discussing her limitations/need for accommodations on completing her assignment. This advocate could possibly be the professional who diagnosed her ADHD, a mentor from her previous high school, or someone from your local CHADD chapter. Information in regard to a public advocate she may obtain from the public defender’s office is usually listed in the local phone book or the disability law program, which should be available in each state. We also recommend that you may want to put together some information on ADHD in the criminal justice system to share with the judge. We can help by sending you some of our materials electronically or mail you hard copies, if you prefer. You can also find a good deal of information online at our ADHD Justice Support Center, which we are working to build into a comprehensive resource on this issue. I would be happy to be a resource for this woman and her daughter. I am not familiar with the specific laws in her location, but $1,000 does seem high for a first time offender misdemeanor bail, as does the amount of community service, costs and fines that she has had to pay. While she may not have completed her community service timely, she is either complete now, or substantially completed. At all costs, she needs to be represented by someone. That is crucial. In my opinion, the best way to handle something like this is to have an advocate, attorney, or even her clinician, draft a letter describing that it is not a willful failure to comply, but both the crime (impulsivity) and the difficulty in timely completion of her service (executive functioning impairment) are consistent with her diagnosis. The letter should also describe what the symptoms of ADHD are and how they impact defendants in her case. It would also be helpful if she has timing accommodations in her school. I would also stress that this explanation, in no way is to seek a waiver of the punishment, but a consideration to extend her time and to help the judge understand that it is not a voluntary disregard for the sentence. There has to be some type of court appointed counsel program (legal aide society, or court appointed private attorneys for indigent defendants). That needs to be investigated. I would also recommend that she go to the COPAA website and see what resources, advocates and/or attorneys are available in her jurisdiction. She could also contact the State Department of Education. Each school is required to give parents a “Procedural Safeguards Notice” telling them about low cost or free advocacy services in their area, if they are having difficulty with the school district. Many times there are state funded advocacy agencies that may be able to lend a hand. UNDER NO CIRCUMSTANCES, should she let her daughter face the judge alone without counsel. I also think it is highly advisable to have someone head off the situation, by requesting an extension of time, in writing, in advance. The last thing she wants is for the judge to think she is trying to get away with something. Transparency here could make a huge difference. I hope this is helpful. If she has further questions, please feel free to have her contact me. We’d love to hear from you! The ADHD Justice Support Center has been created to help those seeking more information on the topic of ADHD and the criminal justice system. You can help us continue to grow, simply by telling us what else you’d like to know! Please email any questions you may have to ADHDJustice@add.org, and check back here to read responses from our ADHD Justice experts!